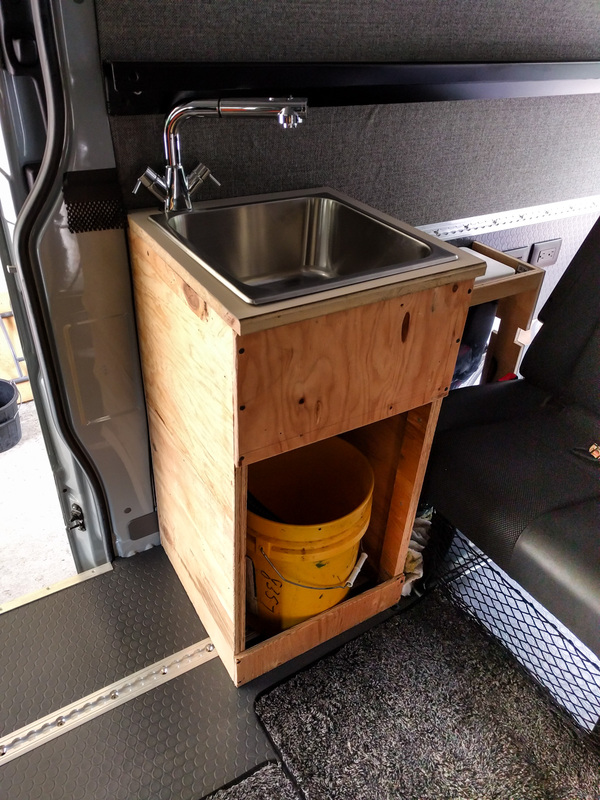 We’ve been driving around with a prototype sink cabinet made from shipping crate wood for a while now. It was time to finish the job. We used aluminum extrusions with t-slots in each side to make the frame, then slid 1/4″ bamboo ply in to the slots to make side panels. The shipping crate cabinet did a good job for us. However, it wasn’t quite sturdy enough, it looked pretty bad, and it kept dropping splinters of wood everywhere. The new cabinet has the same dimensions but it’s a lot stronger. The frame is made from aluminum extrusions sold by 8020.net. Their tagline is “The industrial erector set” and that’s not far wrong. We chose the black anodized finish because it fits with the look of the other cabinets better than the regular silver aluminum color. The bar has slots that run the length of each side, unless you specify options with blank faces. Various fittings will slide in to the slots, so you can connect multiple bars together or connect other things to the bars. 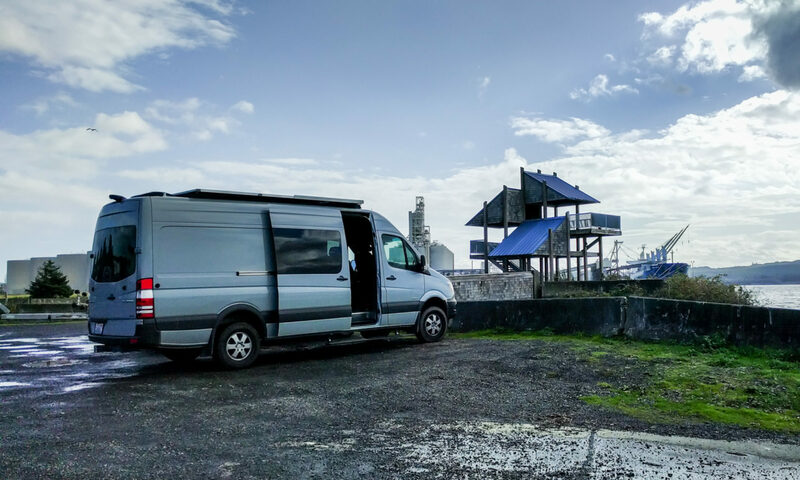 If you want to learn more about the different options for using this stuff in a van conversion, check out this thread on the sprinter forum. We ordered pre-cut and pre-drilled pieces because we trust 80/20’s measurements more than we trust our own. Within 30 minutes of getting the package delivered, we’d built the basic frame. That’s pretty impressive. Years of practice playing with Lego and Meccano (apparently more of a European thing than an American thing) obviously set us up well for this task. Cutting the wood for the panels obviously took a little longer. It was really easy though, because there are no wood-to-wood joints. The panels just sit inside each face of the aluminum frame. We did use two additional layers of 1/4″ bamboo ply to build a frame around the back side of the door panel so it has some thickness and can take regular hinges and catches. 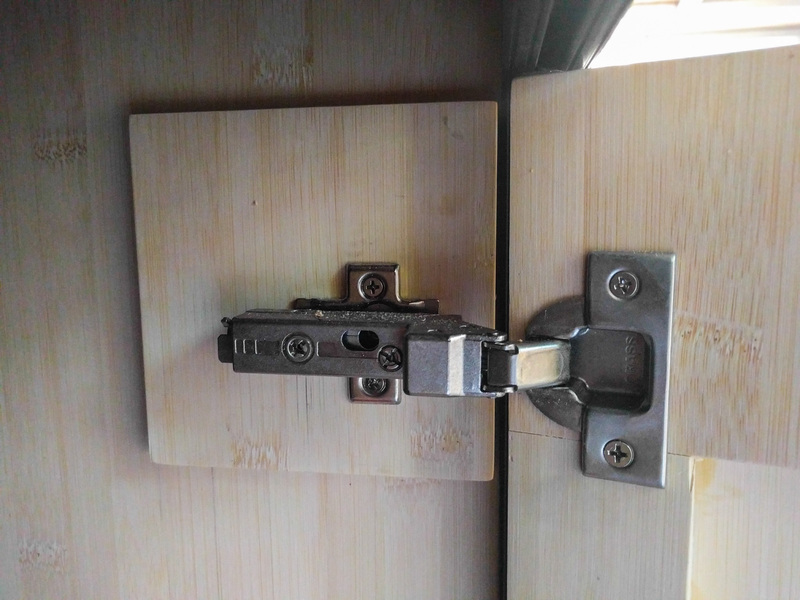 The door hinges needed more strength and “bite” than 1/4″ ply provides, so we doubled up the thickness in those areas of the side wall too. We just glued additional pieces of bamboo ply in place, with a 1/8″ ply piece sandwiched in the middle to create the correct thickness. Hopefully, now that the hinge screws are attached, that will provide enough strength to keep the small glued on pieces in place. We needed a way to secure the door catch to the 80/20, so we just cut a small piece of aluminum angle to size. The strike plate part is cut on an angle so it can be slid from side to side to adjust the latch point. As you can see, it’s a little too thick right now because the latch is all the way to one side. But its very easy to take the aluminum off, grind it down, and re-attach it. The counter top is still the nasty piece of old laminate-coated chipboard from the prototype. We haven’t cut a proper section to size yet. The whole cabinet is secured to the van using the l-track in the floor and wall. It’s easy to make custom brackets that connect to the 80/20. 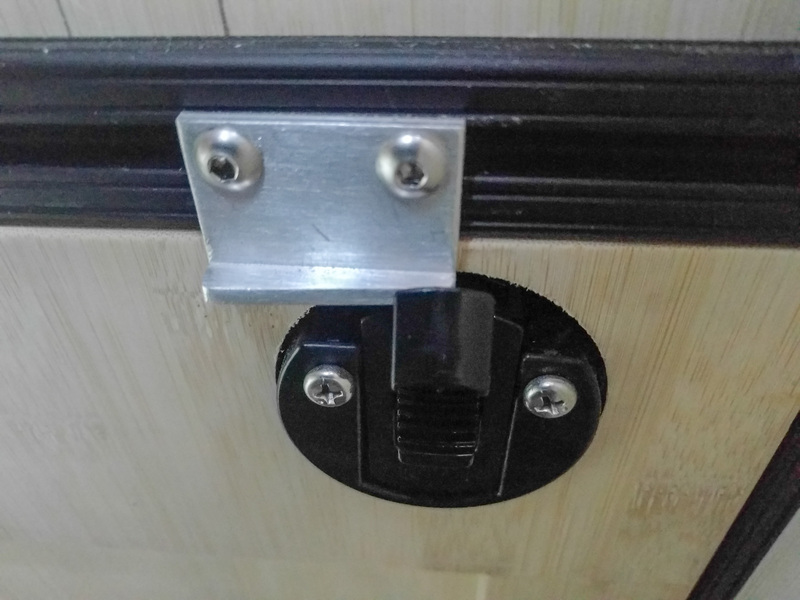 You just need to drill holes for bolts that will connect through to nuts inside the t-slot. With three connection points, the cabinet doesn’t budge. The biggest benefit of this system is how light it is. The entire aluminum frame, with all the bamboo pieces fitted (but not the countertop, sink, or faucet) weighs less than 25lbs. Now we’re wondering how much weight we could save by re-building our existing cabinets with the same technique. UPDATE: Based on the interest this cabinet received here and on the Sprinter forum, we’ve written a new post with more detail about how to actually construct the cabinet, including what to order and how to put it together. This is great! Would you share what you ordered from 8020? I am looking to build something exactly like this. I see a grey water tank, I’m assuming water is plumbed from a tank mounted elsewhere? Yes the water is plumbed from a tank elsewhere in the vehicle but there is space under the cabinet for two of the 5 gallon containers, so you could theoretically use one for fresh and one for grey water. Here’s a screenshot of the 8020 order I placed. If this isn’t clear enough for you to work out what you need, let me know and I’ll put something more coherent together. Thank you DF! This is perfect. I’ve read the threads on SF, but for me, I think I just need to get my hands on it. I am going to replicate your order and start from there. Thank you for your help! I love your page. Hi Adam, 80/20 is definitely strong enough to make the bed with. Their site has a calculator for deflection and weight limits. You’d probably want one of the larger size extrusions. Several people on the Sprinter forum have used it this way. One person even built a bed that converts to a sofa. The only real issue is the cost. You might find it cheaper to buy a bed kit like we did. I got excited with the idea of building cabinets using road case hardware. But then saw that you went to 80/20. What is the downside of road case hardware? I plan to build removable cabinets secured with L-track borrowing from your ideas. I still love the idea of the road case hardware, but there are distinct issues. 3) The cabinetry needs all six sides in place in order to be strong and hold its shape. 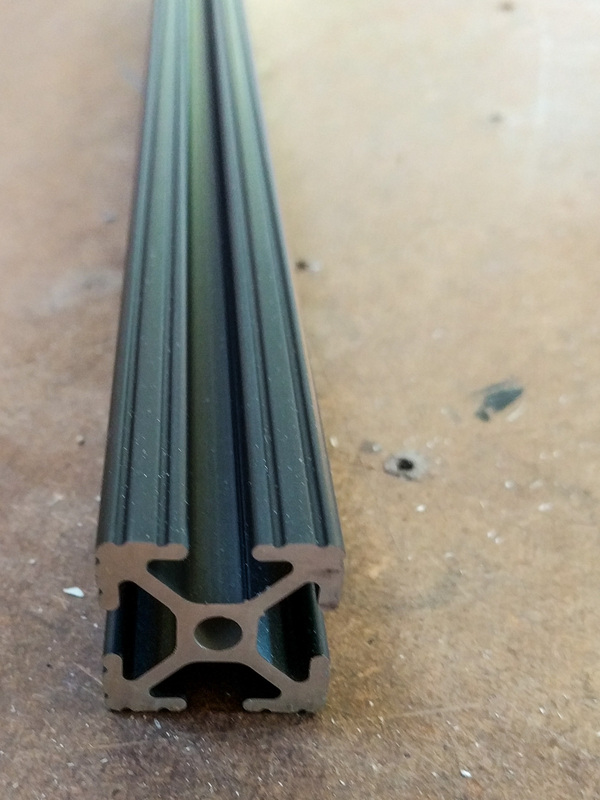 4) You’d probably want to use 1/2″ extrusions to provide enough rigidity. If you use 80/20, doors and drawers are still a bit of a pain, but they’re able to use more of the cabinet width. Corners are cleaner. The frame is strong even without side panels, so you don’t need to put a back or a floor in place. Your panels can also be 1/4″ rather than 1/2″ thick, saving a bunch of weight. The 80/20 is also really easy to secure to l-track. I think you can get a pretty good road case “look” with the 80/20, with more rigidity and potentially a lower weight. If you choose to go ahead with the road case components, let me know how it turns out. I love the look, and I’d love to see it work in a van. For us though, the 80/20 was just more practical and lighter weight. Sorry if I missed this, but how are you securing your storage and utility cabinets, the ones over the wheel wells finished in the coin rubber. I get that the kitchen cabinets where secured into the L-track and love that idea, but wasn’t sure you did the same for the others (that contain your battery, water tank, etc). Thanks for such a great site and resource! Nick, well spotted! The rear cabinets aren’t removable. Instead, they are built into the walls of the van. 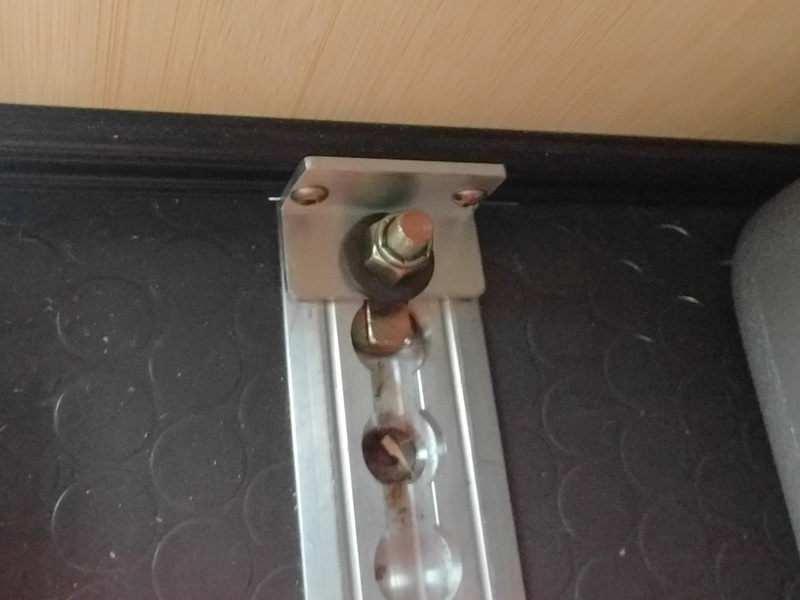 The “wall” of the cabinet closest to the van wall is held in place by the flanged L-track at the top, and by bolts into rivnuts in the van wall at the bottom. 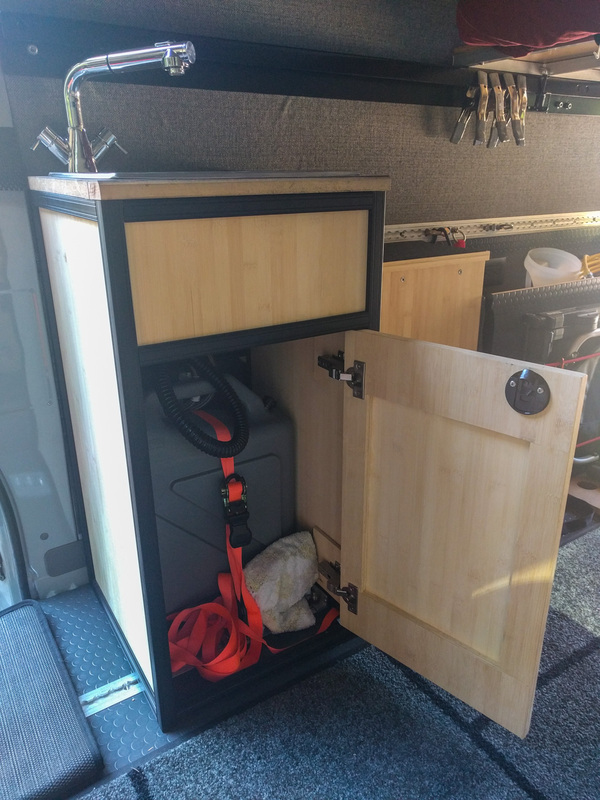 There was no need to make those cabinets removable because the stuff in them stays in the van full time and would require a lot of disassembling to take out.